Unique Moments Photography traveled to the Sun Mountain Lodge in Winthrop Washington to capture a wonderful winter wedding. Right smack in the heart of the cascade mountains, the Sun Country lodge offers it all for winter weddings. Plenty of the white stuff, beautiful vistas, plenty of cold air ( it was 18 degrees at sunrise), plush accommodations for your guests, outstanding food and dining facilities, and a staff that is top notch. You cant go wrong with this venue. It has everything imaginable. Our bride had her sight set for a winter themed wedding. The day started of very cold and it was only 34 degrees at the start of the ceremony. But no one complained one bit. This was a smaller intimate family event with close friends invited. 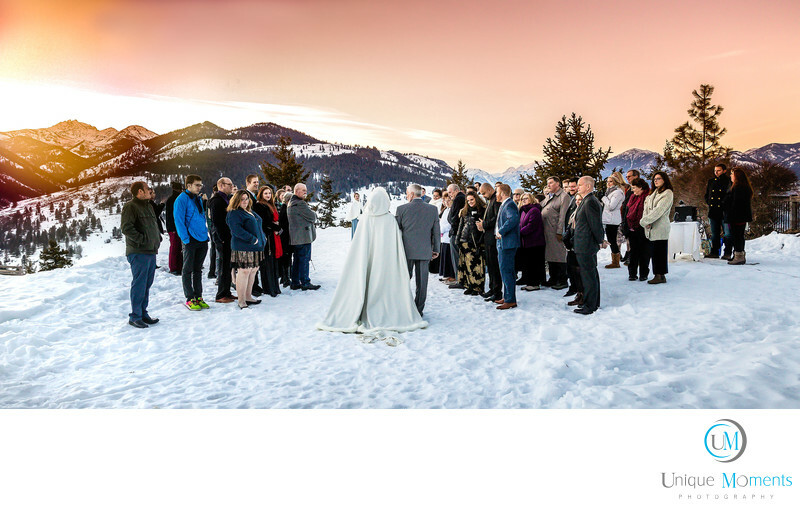 Formals were captured overlooking the cascade mountains and she had a horse drawn sled arrive for fun pictures with the bride and groom, the bridal party and family members. The day was simply perfect. The reception was in a smaller private banquet room and the food served to the guests was simply outstanding. Reception activities included speeches from the best man and Maid of Honor, cake cutting, and the first dance for the bride and groom. The father daughter dance and the mother son dance followed. Soon after, the bridal party and close friends invaded the dance floor and danced the night away. This wedding was perfect from start to finish and we were truly honored to have captured this one. The cascade mountains are beautiful in the middle of winter. Its worth a trip to go see them and play in the snow.